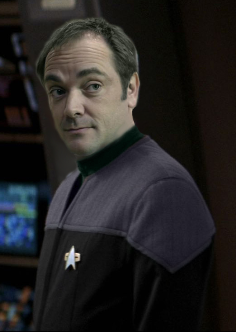 He was born in the 2320s in Bristol, England, and attended the University of Oxford, where he earned his doctorate, and later Starfleet Academy. By 2378, Cambridge had attained the rank of lieutenant with almost 30 years in the fleet and, after several years serving at Starfleet Medical, was assigned to the USS Voyager, under the command of Captain Chakotay. Prior to that, his last shipboard assignment was the ill-fated USS Melbourne, which was destroyed during the Battle of Wolf 359, Cambridge was one of the crewmembers who escaped the destruction of the ship in the escape pods. He has accrued a number of commendations and glowing reports by his superiors throughout his career, and has published numerous papers in various psychological and archaeological journals. Initially Cambridge failed to impress his new captain, who disliked his frank demeanour and seeming lack of regard for protocol. The mutual lack of respect for the other marred their relationship for the majority of the almost two years Cambridge has been on Voyager.